Congrats to the folks at Mixx. 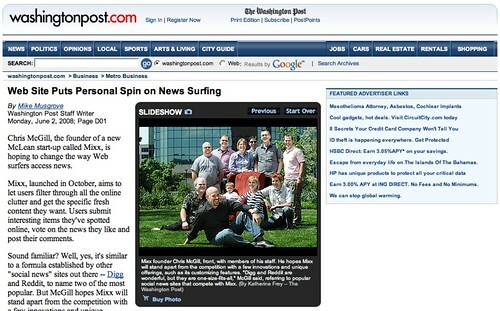 Chris McGill, the founder of a new McLean start-up called Mixx, is hoping to change the way Web surfers access news. Mixx, launched in October, aims to let users filter through all the online clutter and get the specific fresh content they want. Users submit interesting items they’ve spotted online, vote on the news they like and post their comments. From personal experience Mixx is more spammy than Digg. Perhaps, I should be using it more strategically. And there is always the option of not following other people and just following Mixx headlines.